One of the best things about celebrating the 4th of July is the amazing cookouts people have. You can easily jazz up your 4th of July cookout so that it stands out from all the others. Yours will be the party everyone has to go to next year! Just do these simple changes to add something special. I love a good hot dog and hamburger as much as the next girl but that is what everyone has come to expect. To really make your cookout special, add some variety to the grill. You can BBQ an amazing beef brisket, a whole chicken, or some gourmet bratwurst. It is just nice to have something different then the expected. You can easily make a fun photo backdrop using an American flag. Just hang it up on a wall or on the side of your house and have people take family photos. You can even get some fun props and let every one get creative with their pictures and selfies. A great party has to have great music. I like having a variety playing so that every one can hear something they love, you can’t go wrong with some good 80’s music! An easy way to get a great playlist is to just hook up Pandora on your speakers. You can just type in “4th of July” or “Cookout” in the search box to get some great song ideas. It is nice to have some easy side dishes or appetizers out for every one to enjoy while the main course is being cooked. 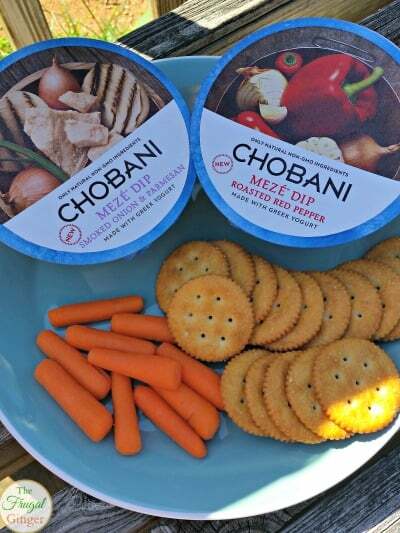 Instead of plain old chips and dip, you have to try the new Chobani Meze Dips. You can pair them with fresh vegetables, chips, crackers, bread, etc. 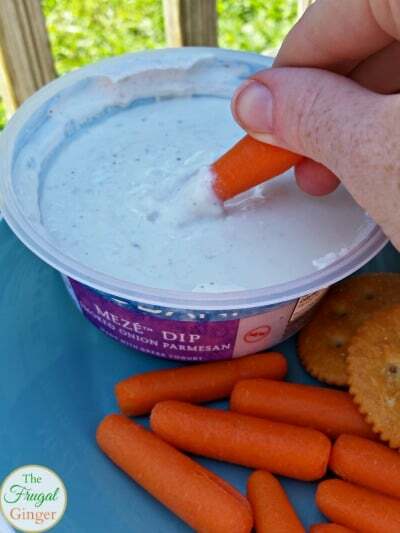 They are made with real veggies, herbs and spices blended with creamy Greek Yogurt in a shareable 10oz container. The containers are cute so you don’t even have to mess up another bowl. I love that they are made with only natural, non-GMO ingredients and they have 80% less fat and 65% fewer calories than the leading hummus. 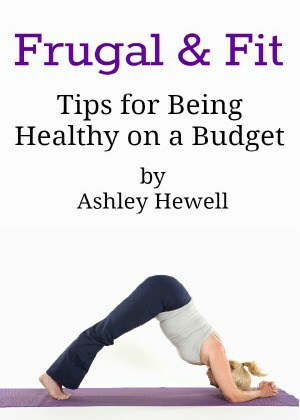 They are a much healthier option. Chobani Meze Dips come in four delicious flavors: Roasted Red Pepper, Three Pepper Salsa, Chili Lime, & Smoked Onion and Parmesan. They are available at your local Target, Meijer, and Walmart. You can even grab a coupon so you can save on your next purchase. I tried the Roasted Red Pepper and the Smoked Onion and Parmesan flavors. They were so good and refreshing, perfect for a hot summer day. I loved how thick and creamy they were. I have included them in my party and snacking activities! I am a big fan of fruit platters at cookouts, they are easy and healthy alternatives to cakes and cookies. Just setting out a fruit tray can be boring though. I love the idea of these Red, White, and Blue strawberries. Both kids and adults will love them. If you want a classic, a good old fashioned American apple pie is always a crowd pleaser. 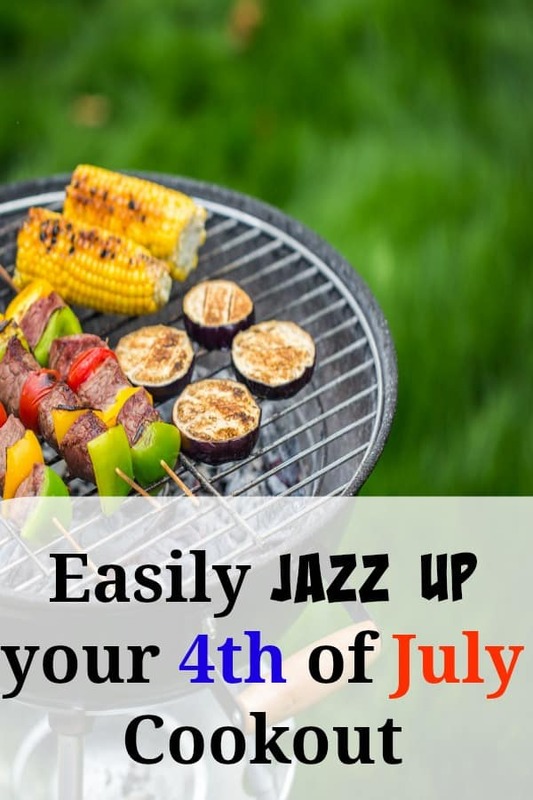 These are just a few ways you can really jazz up your 4th of July cookout by going the extra mile. I hope everyone has a very safe and happy holiday no matter how you decide to celebrate!